Reading the Fantastic Four comics from the start. Issue #396 really gets the ball rolling, building up to issue #400 and, more importantly, writer Tom DeFalco’s eventual end game in issue #416. Also, cartoons! The issue begins with “Dr. Doom” making a public appearance in the streets of Latveria. Of course it’s really a Doombot, used by Nathaniel Richards to convince the world that he’s Doom. Sue is still hanging around Castle Doom, still demanding answers. Nathaniel says he must pretend to be Dr. Doom because he has a personal stake in safeguarding Latveria’s interests. When she insists on even more answers, there is a short fight between her and more Doombots, he doesn’t answer any of her questions about Reed or this other son Nathaniel mentioned. He says that if he and Sue are to discover Reed’s true fate, then she has to stick around and play along. At Four Freedoms Plaza, Ben thinks the building is under attack, but it’s just Ant-Man watching the new Fantastic Four TV cartoon. (It’s not named, but this is supposed to be The Marvel Action Hour, featuring both the FF and Iron Man, which debuted around this time.) They see the mysterious apparition of Sue, once again attempting to give them a dire warning. Both Ben and Ant-Man agree that they thought this apparition business was done with during their recent time travel adventure (The “No One Gets Out Alive” story arc) and Ben says they should find Sue immediately. Elsewhere, we find the Watcher, who is of course watching all this. A mysterious man tells the Watcher that the FF will soon become suspicious of his actions, and the Watcher says if the FF come after him, they will be destroyed. In Latveria, Nathaniel equips Sue’s FF time sled with a device that will take them to Nathaniel’s unnamed son. At FF HQ, Ant-Man uses Dr. Doom’s old time machine, which the FF still have, to follow Sue and Nathaniel. Sue and Nathaniel arrive on a snowy mountaintop in Tibet, where they are attacked by monks with laser weapons, calling themselves “the Monastery of Doom.” Sue somehow recognizes them as the ones who originally trained young Dr. Doom in the “dark arts.” While Sue fights the monks, Nathaniel sneaks into a cave, in search of his real objective. In “the Great Western Desert,” Johnny is still at the ESU archeological dig, where he flirts big time with hot blonde Laura Green. Laura is secretly Lyja the Skrull in disguise, still following Johnny. She can’t believe he’s actually flirting with her. Then they see the apparition of Sue. Johnny flies off the rejoin his old teammates, and Laura/Lyja catches a ride to the airport for the same reason. Sue makes her way through the monastery, apparently located inside the cave, where she finds a high-tech lab and two bodies in suspended animation pods. She thinks she has found Reed and Dr. Doom, but before she can open the pods and know for sure, Nathaniel steps out of the shadows and shoots her in the back. With her unconscious, Nathaniel makes a big speech about he will now gladly and eagerly unleash total evil onto the world. 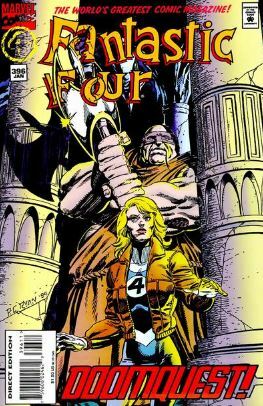 Fade out: Inside the monastery, Sue walks past locales seen in past retellings of Dr. Doom’s origin, most notably issue #5, issue #278, and the miniseries Books of Doom. 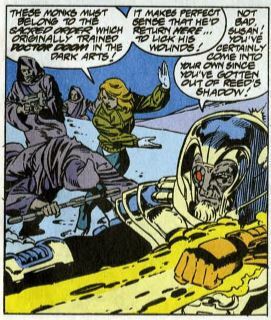 She comments about the contradictions in the different versions of Doom’s origins, and she speculates that these stories originated from Dr. Doom himself, always rewriting his own history. Clobberin’ time: Apparently, Ben signed away the FF’s TV rights to help them get through their recent financial downturn, after all the troubles caused by Johnny destroying part of ESU a ways back. Flame on: Johnny remarks that he has put the dark times behind him, and he’s feeling a lot more like the carefree, youthful “hothead” Johnny of classic Fantastic Four comics. Fantastic fifth wheel: Although Ant-Man makes jokes about how awful the FF cartoon is (great cross-promotion work, Marvel) he later says he’s just kidding, and that his daughter Cassie has a Thing lunchbox (!). The Alicia problem: In previous issues, Lyja said her “Laura Green” plot was to win back Johnny, but in this issue she seems repulsed at how he is flirting with her. I guess it’s because he’s flirting with “Laura” and not Lyja. 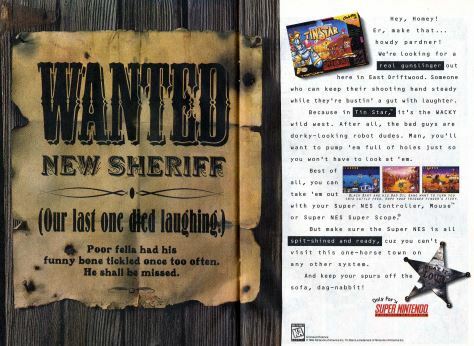 Commercial break: This issue has not one or two but three pages of ads for Nintendo’s Tin Star. It’s the WACKY wild west! Trivia time: The Marvel Action Hour cartoon is canon, existing in Earth-534834, for those of you keeping spreadsheets. This is the third Fantastic Four comic in which the characters watch a TV cartoon based on their own exploits. The first was in issue #10, and the second was in issue #209. Fantastic or frightful? A lot of this issue is Sue asking perfectly reasonable questions and Nathaniel refusing to answer to he can look all mysterious. It’s mostly setting up things to come. The references to Dr. Doom’s past are nice for fans, and the cartoon tie-in makes this an interesting trivia footnote, but that’s about it. Next: Who watches the watchmen who watches those watchmen who watch those other watchmen?